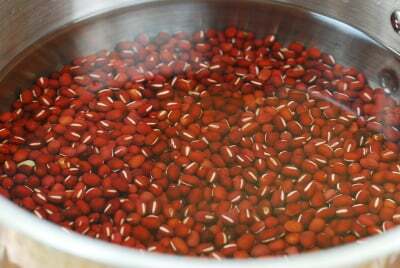 I love anything made with these small red beans called pat (팥) (aka azuki or adzuki beans). Good thing they are rich in nutrients! 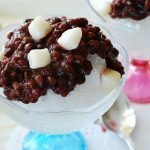 In the summer, I use these beans to make a popular shaved ice dessert, patbingsu . When the weather turns cool, I use them to make a porridge, patjuk (팥죽). 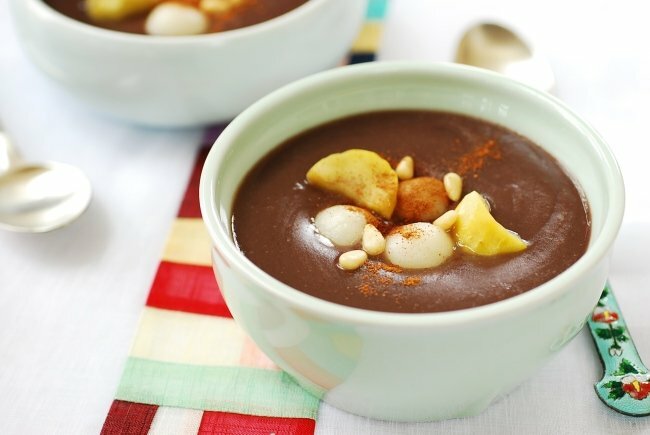 There are two types of red bean porridge in Korea – savory and sweet. Traditionally, savory patjuk is made with soaked short grain rice. 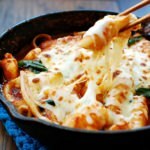 It’s very filling and usually eaten as a meal with kimchi or dongchimi. 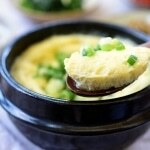 This is the type of patjuk that’s customarily eaten on the winter solstice day (dongji). The custom originated from the ancient belief that the red color of the beans had positive energy that could drive away evil spirits. 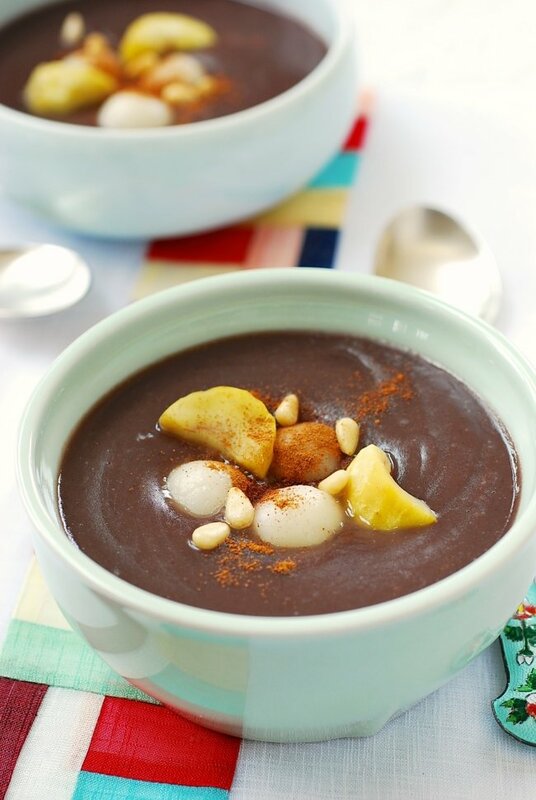 The sweet red bean porridge is called danpatjuk, 단팥죽. Dan means sweet. The sweet one is typically velvety smooth without grains of rice that are in the savory patjuk. In recent years, the sweet version is increasingly popular and enjoyed as a snack or dessert. 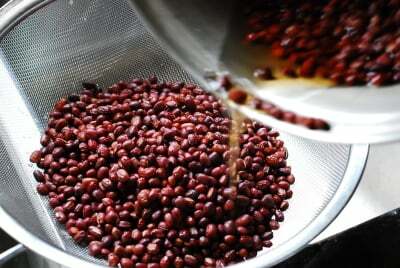 To make patjuk, the beans are cooked down until very soft. Then, the cooks traditionally mash the beans through a strainer to remove the skins to achieve a velvety texture. This process can be grueling, so I use a shortcut. Puree the beans as fine as possible in a blender. 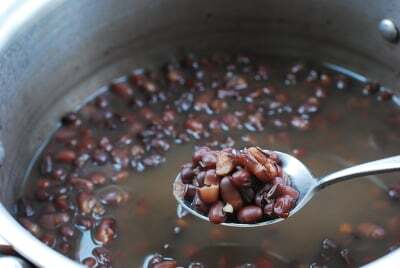 It’s much easier while still resulting in a very smooth porridge, and you don’t waste the nutritious bean skins. 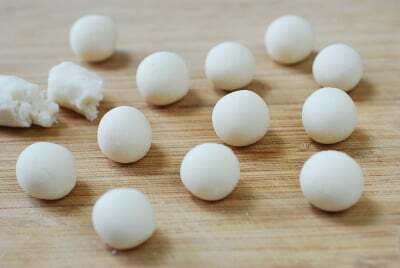 This porridge is served with sweet rice cake balls called saealsim (새알심), bird eggs. They are easy to make with sweet rice powder/flour. I also like to top it with pine nuts, boiled chestnuts, and a sprinkle of cinnamon powder, but they are optional. 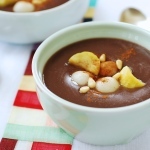 This recipe yields a lightly sweetened porridge. Add more sugar or honey to your taste. Discard broken or rotten beans and rinse the beans. In a large pot, add the beans with 4 cups of water. Bring it to a boil, uncovered, over medium high heat. Reduce the heat to medium and boil for 5 min. Return the beans to the pot with 4 cups of fresh water. 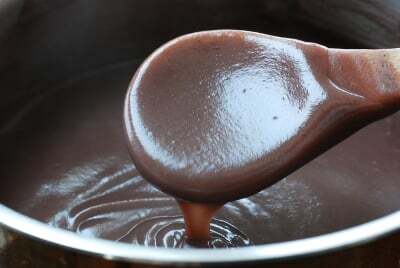 Cover, and simmer over medium low heat until the beans are very soft and easily breakable, about 1 to 1-½ hours. Turn off the heat, and let the beans cool in the cooking liquid. 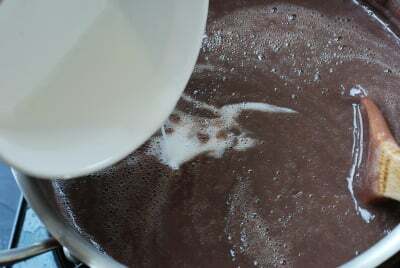 Puree the beans along with the cooking liquid until velvety smooth. You may need to do this step in two batches. Add some water if the bean puree gets too thick. Return the bean puree to the pot. 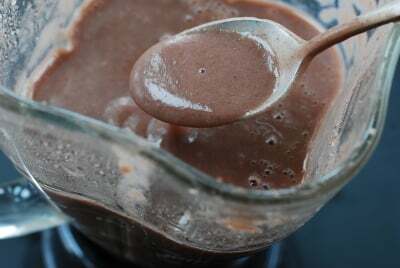 Mix one tablespoon of the sweet rice powder in ½ cup of water, and pour into the pot. Stir in the salt, sugar and honey. Simmer over medium low heat, uncovered, stirring frequently, for about 10 minutes. 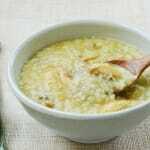 Adjust the thickness of the porridge by adding more water if necessary. 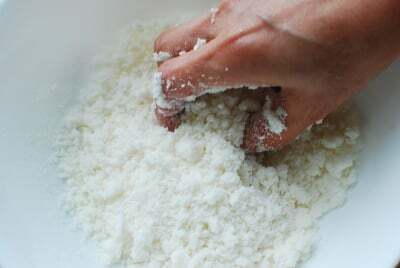 Mix the rice powder, sugar and salt in a bowl. Stir in the boiling hot water with a spoon. When cool enough to handle, knead by hand until a dough is formed. Shape the dough into a 3/4-inch thick cylinder. Cut into (or pinch off) 3/4-inch pieces. Roll each piece between the palms to make a small ball. Bring a pot of water to a boil. Add the rice cake balls. 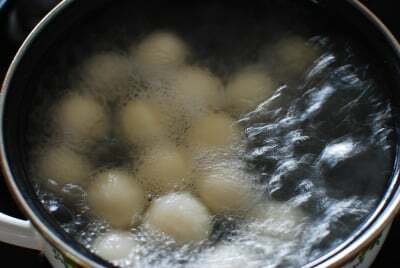 Cook until all the balls float. Transfer to a large bowl with cold water to cool. Drain. This looks delicious and very simple to make ! I’ll definitely try this out. Your blog is amazing, I have tried several of your recipes and they all turned out great. Thank you for sharing ! Thank you so much for the nice words, Laura! I’m thrilled to hear the recipes you’ve tried turned out well. Hope you try danpatjuk soon and enjoy. This looks amazing! I remember my grandmother always making this when we were kids but my family doesn’t believe in measurements so it’s so hard to try and recreate their recipes! Thank you for all your hard work and I can’t wait to try it! Hope it turns out as close as your grandmother’s. But, there’s a famous danpatjuk place in Samcheongdong in Korea, named “the second best in Seoul”. You know whose is the best? The humble eatery thinks it’s the one made in your mom’s kitchen (the same goes for grandmother). Enjoy! Is this the same receipe to use when making rice cakes? I just discovered rice cakes and I love them! Many of your plant-based recipes have turned out great for me and am really enjoying these Korean receipes. 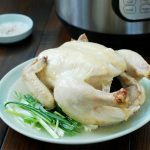 As a Korean born, but adopted into an American- Caucasian family since 5 yrs old, I am discovering Korean cooking for the first time in my life (I am 40+ yrs old). I feel your blog, receipes and learning a little of the Korean language are a gift….thank you so much for this gift! 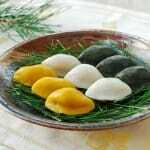 There are many different kinds of rice cakes. 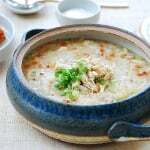 The one I used here is a quick version of injeolmi (인절미), which is traditionally steamed and pounded. I love rice cakes and often make them at home. I have a songpyeon (half moon shaped rice cake) recipe on the blog, but hope to share some others soon. 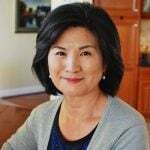 I am thrilled to hear I can contribute to your learning Korean cooking. Thanks! OMG! I want to try this. Chinese has a similar smooth, silky, melt-in-mouth dessert like PatJuk called Black Sesame Soup/Paste. Yup it’s yummy! Hope you try it. I need to try Chinese black sesame soup. Thank you for this recipe. I have been planning to make this ever since 2014, when I had danpatjuk at The Second Best Place in Seoul (which you also mentioned in the comments). I made it today using your detailed recipe and instructions and it turned out great! Many, many thanks. I can’t wait to try some of your other recipes. 감사합니다! That’s awesome, Jara! Glad you got to make danpatjuk to recreate your Seoul memories. I loved that little place and the neighborhood. Will surely visit again next time I go to Korea. Thanks for coming by and leaving me the comments! Hi! 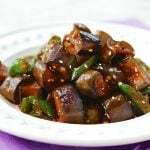 I just saw this interesting recipe and i was just wondering if i could use red beans that are in canned, so the red beans is soft enough to be mashed, i dont know if i still should follow all the first steps of boiling the red beans twice or should i just go boil it once then sauté it in two portions and so on? Hi Kara! Yes you can use canned red beans, and you don’t need to boil canned beans twice. Simply thin is with water and boil.